It’s Wednesday, which means two things: 1) another hour of your life will expire tragically as you watch the filler-laden American Idol results show, and 2) it’s time for a new Geeky Curiosity of the Week! 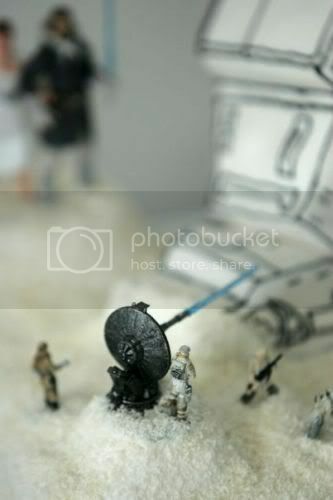 This week, a Star Wars groom’s cake featuring the Hoth battle scene and a felled AT-AT comes to us courtesy of Charles from Tampa “They don’t call it Trampa because of all the classy broads,” Florida. Charlie designed the cake himself and recruited his friend Ingrid to help create it. 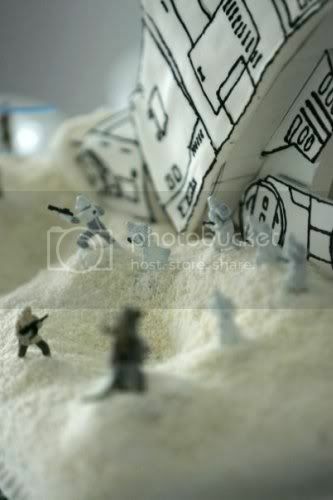 It featured white cake with coconut shavings as the “snow.” They built the body of the AT-AT out of cake and fondant, and used foamcore for the legs. 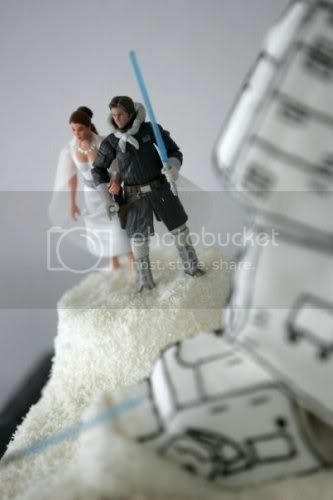 Charlie and Ingrid completed the scene with Star Wars Minatures figures, and with regular 3.5″ action figures for the cake topper. One of the main arguments that I’ve gotten from fellow geeks is that Han Solo shouldn’t have a lightsaber, but of course he uses one on Hoth to cut open the Tauntaun. I busted out the Lightsaber towards the end of the wedding and walked out with it, but that was the only other SW element at the wedding, I didn’t want to go overboard. Thanks, Charlie, for sharing the photos and the details! 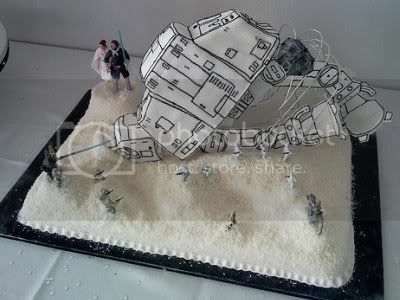 May the Force be with your holy matrimony and stuff. At first I stared at the thing trying to figure out what I was looking at, but the tow-cables gave it away. Also, I read the part of your post where you explain what it is. He would have gotten an extra 100 geek points if he had included the disemboweled tauntaun, with another 100 if he shoveled a little Luke Skywalker in there. But, yeah, I guess it’s all right without that. Also, way to reference the turd cake. It’s still my favorite (provided “favorite” is defined as the most hilarious thing ever). @Nima: Everyone knows that turd cake is your favorite. Hmmm. Very conflicted. It’s a great looking cake, but the scale issues between the Han+Leia action figures and the rest of it are driving me nuts. @nickolai: This isn’t the first time your “scale issues” have come up. For whatever it’s worth, I hear pot works pretty well for OCD. Not sure which I enjoy more — the sweet (no pun) cake or the fact that on a CAKE it’s so easy for people to start complaining about deviations from the literal movie references and character scaling and what not. It’s a CAKE people — it’s a piece of interpretive art, but a CAKE nonetheless. Can’t someone take some poetic license with the iconography without catching flack? Man, GWS, your snarkitude must be contagious. I’m becoming a right snarky git. Nathan, I don’t think you fully appreciate the depth of nickolai’s issues with scale. Try to be sensitive a fella’s medical condition, would you? It is a sickness, I admit. I once had a train-shaped cake for an early(-ish) birthday party. The cow-pusher was enormous relative to the rest of the engine. Needless to say, I refused to eat it. Melbellz, you do realize I covered the dead tauntaun cake here on GWS before StarWarsBlog or any other major site on the interwebs, yes? Because you surely wouldn’t just go randomly posting the cake to various sites… right?